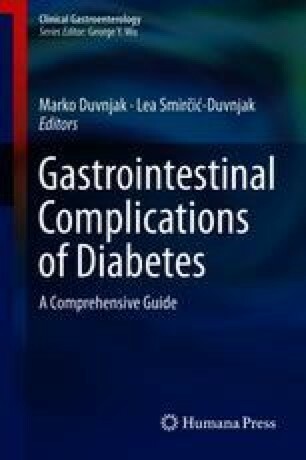 For the most part, there are no specific guidelines for the management of upper gastrointestinal symptoms and disorders in the diabetic patient. Given the impact of hyperglycemia on upper gastrointestinal motility, attention must always be paid to glycemic control. Conversely, the impact of poor oral intake and recurrent vomiting on blood sugar levels and overall nutritional status must, at all times, be borne in mind. In the assessment of the diabetic with GERD, the possible contribution of impaired motility to symptomatology and its implications for therapy must be remembered. Many options are available for the symptomatic and supportive management of diabetic gastroparesis; their efficacy is often supported by a slim evidence base. Landi SN, Sandler RS, Pate V, Lund JL. No increase in risk of acute myocardial infarction in privately insured adults prescribed proton pump inhibitors vs histamine-2 receptor antagonists (2002-2014). Gastroenterology. 2017. https://doi.org/10.1053/j.gastro.2017.10.042. [epub ahead of print].